Back between May and July, news about Cube World was rife. Look How Cute It Is!, Let's Watch People Play Cube World, I'm Addicted To Cube World... And suddenly... Nada. Zip. Zilch. What Happened to Cube World? Back in May Cube World was an exciting, upcoming project by Picroma that married Minecraft with Legend of Zelda, with maybe a little hint of World of Warcraft in there. Based in a humongous voxel world in an engine built entirely from scratch, it slowly built a dedicated following of fans who craved a playable version of some sort be put into their hands. 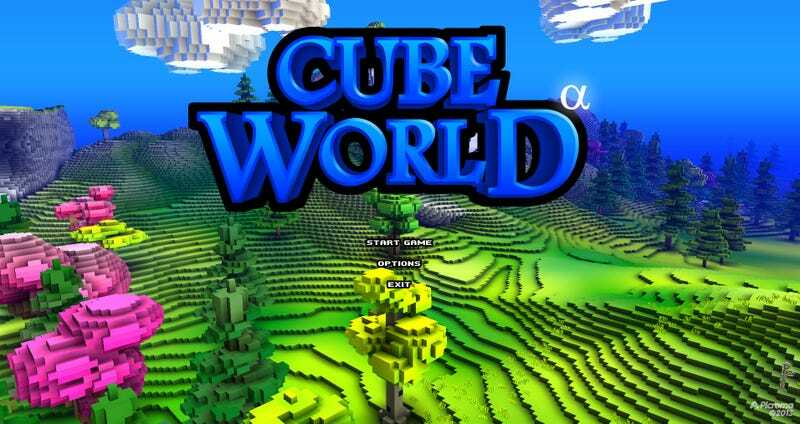 Come July, these dreams came true and a playable Alpha Build of Cube World was made available for $20. "We're planning to release updates regularly. Updates are free." Cube World received its last update on July 23rd. Many fans are scratching their heads, wondering why the silence has gone on for so long. Many feel that they have been conned and deceived. Many feel that the developers have abandoned the project for good, leaving the once promising Cube World to gather dust as yet another sorry piece of vaporware. The Developers themselves, Wolfram 'Wollay' and Sarah 'Pixxie' von Funck, have not updated any of their social networks since Gamescom in August. Their Twitter's are eerily dormant, having died indefinitely, together, only days apart. The Picroma and Cube World Facebook pages are equally desolate, their only activity being the lost cries and decadent wails of the confused fans. One of Wollay's last tweets promises imminent updates... And then nada. The Developers are nowhere to be found. It appears our Princess is in another castle. Many of the long-term fans claim that this type of behaviour is typical of Wollay, and that he'll resurface with an update that is larger-than-life, and was well worth the wait. Personally, I think I smell a rat. A single tweet would be enough to cull these fears, at least for a while. I also find it both strange and worrying that Patricia Hernandez, resident Cube World junkie, hasn't asked this question before me. It's strange that a game that seemed so innovative, so promising and so full of spirit can appear to be dying a drastic heat-death. Interest in upcoming updates is drying up, and the Cube World community is becoming a burned husk of a lover forced to learn that you test the waters before you dive in. Early Access payment plans are beginning to become a controversial subject, and Cube World appears to be yet another casualty. Strangely enough despite the growing levels of inactivity the Picroma website continues to function, Cube World can still be purchased and the company details can still be found online, including a phone number. It would be interesting to hear if that phone number is still in service, and if it still offers a direct line to Picroma. But for now it seems that the Picroma team are MIA, and Cube World doesn't have much time left before it fades to black, becoming whispers in the wind of yet another video game industry tragedy come to pass. [UPDATE] Kotaku reached out to Wollay and have received a response. The update is under way and Cube World is still being worked on.